Last Sunday I went to Warsaw to share my opinions on the Championship Sunday, upcoming SB48 and discuss the current situation in the PLFA on NaStyku Sports Show at Orange Sport hosted by Adam Styczek. I also thought it would be as great opportunity to interview Eagles HC Dale Heffron. As you may already know, things turned out quite unexpectedly. Around 5pm I entered the Champions Sports Bar sat down and while waiting for the man to arrive was enjoying the ManU – Chelsea game, not a bad starter starter before the NFL action. Before I go deeper – when you think Poland one of the most common stereotypes are beautiful women, Lech Walesa, Pope John Paul II and vodka. Yes, alcoholism is a huge problem in our country and drinking and driving has been in the media more often than commercials since the Jan 1st 2014. A tragic accident happened that day, as one drunken driver killed six people. Since then the crusade began – politicians started to propose new laws and throw better and worse ideas to solve the problems. Mainstream media and tabloids began the witch-hunt. That should put things into perspective a little bit. He asked what my plans for the evening were, I replied that I wanted to watch the games in the hotel. He suggested that the team organized a bonding event in a nearby restaurant and if I wanted I may join in. Can it get any more ironic than that? I’m taking a Taxi tonight, said Coach Heffron early in the evening. And some crazy stories about the parties in NFL during the 70’s popped out. As we were getting closer to kick-off more players started arriving . It was a pleasure to see the veterans, who founded the team. Also the members of the Orle Gniazdo- official FanClub showed up. Dale made a short speech about how excited he was to be coaching Eagles, the game started the food and more beer started arriving. As we were getting closer to halftime one of the veteran players offered that I could stay at his place, so I didn’t have to pay for the hotel. We left, took a taxi, arrived and by the time we have set up the streaming the Broncos were leading 21-3. Meanwhile, at Tortilla Factory the Football Fiesta, continued. Just to clarify in Poland the tolerated alcohol limit in your blood is 0,2 per mile, one of the lowest in Europe. I’m not a walking alcotest but by the time I was leaving Coach Heffron should not drive that night. Now here comes the tough question-by the end of the game I’m pretty sure that there were still at least few people tied to Warsaw Eagles in the restaurant. Heffron’s the car was parked outside the place. You are all leaving and see your Coach condition yet nobody prevents him from driving? Or suggest ordering a taxi? We are one week away from the SuperBowl Parties think about it guys – don’t watch react! If you were watching SF vs SEA game the first major play of the game was a strip sack by Aldon Smith, who has been charged with DUI and missed 5 games because of the rehab earlier this season – I tweet one word #Redemption. Probably around that time Jacek Sledzinski’s WE GM must have received a call – and as the old Football business wisdom says - If your phone rings at 1 a.m it’s not a good news. On Monday, I did my media duties, met with PLFA President Jedrzej Steszewski and got a FB message from Philip Dillon WE Director of Football Operations that he wouldn't be able to meet me later that day and if we could talk over Skype or phone. On my way back to Poznan I was digesting the meetings and started preparing this edition of WW …. On Tuesday morning one of my friends posted a tweet with a link to Super Express - polish tabloid-website. The essence of the story Dale H. (59) was stopped late Sunday night by the Warsaw Police for DUI. Later that day Warsaw Eagles released a statement: Current HC Dale Heffron has been suspended after he was stopped for DUI . Today there will be a Board Meeting that will make final decisions on his future. 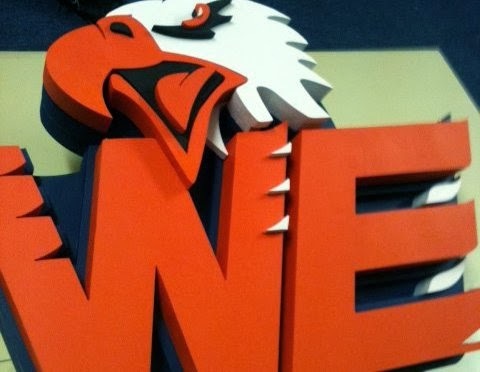 Warsaw Eagles condemn the practice of driving under influence of alcohol. God forgives, the internetz don’t. The bombs were dropped –the storm has begun. The legion of keyboard warriors started talking, the social media crucification followed. On Tuesday evening I spoke with one representative of the Eagles inner circle: “In the best interest of the whole organization it’s best that this thing finishes –as soon as possible. One way or the other! From my sources the delay in the announcement of the final decision was caused mainly but not only by the uncertainty about the QB’s Zach Cavanaugh fate in case of team cutting ties with Heffron. Roman Locuta Causa finite – Roman has spoken the case is closed! Roman Iwanski is the President of the Warsaw Eagles , he is also a successful lawyer. The majority of WE daily operations are conducted by GM Jacek Sledzinski, therefore if Roman speaks it matters. On Friday evening, Eagles released statement informing about Dale’s Heffron resignation, that followed the arrest. The team highlighted the fact that Coach Heffron acted as a man of honor, and that the organization will support him so that such incidents won’t happen again. Warsaw Eagles have also started cooperation with Krzysztof Holowczyc Foundation - a respected polish rally driver. During their home games fans will have the chance to learn the rules of safe responsible driving and learn CPR techniques. The aftermath - what have we learned from the Sunday Night Fever? JackStrong – current Defensive Co-Ordinator Jacek Wallusch has taken over as an Interim Head Coach, while Eagles are searching to fill their staff. He certainly is a LEADER and can navigate the ship through the rough sea. Hate Speech a lot of “bullet points” have been circulating around polish football internetz. If were among WE coaching staff I would copy each of the stupid posts to my drive, print it and gave it to the players. The game of risk vs reward - Now we have the knowledge that Eagles had the knowledge about Heffron’s red flags, yet they have decided to give him a chance. Can we blame them for that? Nick Saban made a point at recent AFCA Convention: You have to know which dogs you can pet and which can bite you? Firstly, I am totally against drinking and driving – there is zero tolerance, it doesn’t matter if you are an average Kowalski, high profile rock star, football coach, priest or a member of parliament. Where there’s crime there must be punishment and justice needs to be done! Whether we like it or not, we are role models for our families and local communities - with the media exposure, comes great responsibility. In the modern world you want the fame you get the blame! And yes, he is the man with a record – successful on the field and has a documented history of losses in the fight against the toughest opponent – the one that we see every day in the mirror. As cliché as it may sound I understand the expectations that we as Coaches should follow higher moral code, lead by example and basically be the walking on water, miracle performers, who like John the Baptist live on the desert, eating honey and loctus. Don’t treat is an excuse but are only humans, we have our flaws and we make mistakes. I often employ “Richard Sherman PR mode”, or send emails that should never been sent. I’m impatient, often shout at practices and am pretty demanding am pretty terrible at relationships – I may not have made every wrong choice of nearly 30 aged man can make but I had my share. And am sure that lots of you also have, however there is something I love about sports – it gives you a chance to redeem yourself, we love the stories about comebacks. As for Coach Heffron, I hope that this incident will be a turning point in his life, he will turn the page and start a new chapter. Eventually he will get the chance to coach – probably sooner than later. Coaching is not just a profession, it’s passion and calling, we are here to lead and guide these men if nothing else let them learn from our mistakes. I’m not in a position to judge Coach Heffron as a person I don’t know him that long and if you feel tempted, maybe instead, you should clean some of the skeletons from your closet? Comparing Dale Heffron to Rex Ryan is an insult.